The La Flor Dominicana Andalusian Bull, a classic Dominican that won the 2016 Cigar of the Year. It’s no secret some of the best cigars in the world are made in the Dominican Republic. They vary in terms of flavor and strength, from the mild to the more muscle-bound. Here are 11 of the top-scoring Dominican cigars of 2018, and the three that have been given our highest accolade. They’re smoking beautifully right now. This slim cigar (it measures 5 1/2 inches by 44 ring) is the thinnest in the Casa Cuba line, a brand blended by the great Carlos Fuente Sr., who passed in 2016. Elegant and refined, this corona is a must for any Fuente fan. Rolled in Santiago under the watchful eye of Ernesto Perez-Carrillo, this all-Nicaraguan Encore isn’t the powerhouse you might expect. At 5 3/8 inches by 52 ring gauge, it shows notes of English breakfast tea and caramel around a pleasantly woody core (and it won the 2018 Cigar of the Year). Draped in an African Cameroon cover leaf, this perfecto measures 7 inches by 46 ring. The Hemingway line is composed entirely of shapely figurados, but this relatively skinny size is particularly striking. Donning a dark, Ecuadoran sun-grown wrapper and measuring 5 1/2 inches by 50 ring gauge, the Ashton VSG Robusto (as it’s commonly abbreviated) is a full-bodied blend that smacks of oak wood, cocoa and nuts. Bold, yet balanced. For maduro fans, this big cigar (7 1/2 inches by 52 ring) has a Connecticut broadleaf wrapper. It’s a perfect after-dinner cigar that will last all night. Smoke it when you have a couple of hours to unwind. A relative bargain from Altadis that comes with a cedar sleeve. Underneath is an Indonesian cover leaf, and with a sub-$7 price tag (before taxes), this 5 1/2-by-44 smoke is a budget-friendly performer. Trinidad Santiago is rolled by cigarmaker Jochy Blanco, and it contains 100 percent Dominican tobacco. The 6-by-52 Belicoso has an earthy profile. La Flor de Ynclan is Villiger’s fresh take on a long-discontinued Cuban brand. Don’t let the light Ecuadoran wrapper fool you—the Torpedo (6 by 52) has plenty of character and strength. Unlike most Dominican cigars, it’s made in Santo Domingo. Six bucks for a Churchill? Count us in. At 7 inches by 47 ring gauge, this high-scoring smoke—made by the oldest producer of cigars in the Dominican Republic—is one of the best values you’ll find on the market. Dark and gleaming with oils, this is an eye-catching figurado shaped like a stonemason’s chisel. And like the tool for which it is named, it has strength. Measuring 6 inches by 54 ring, it’s a big, bold cigar packed with powerful tobacco. If you’re short on time, but big on powerful cigars, look no further than the Project 805 Petite Corona. This 4-by-40 firecracker sells for less than $5 and is blended solely from Dominican leaves, including a tobacco called andullo that’s uncommon in most cigars. 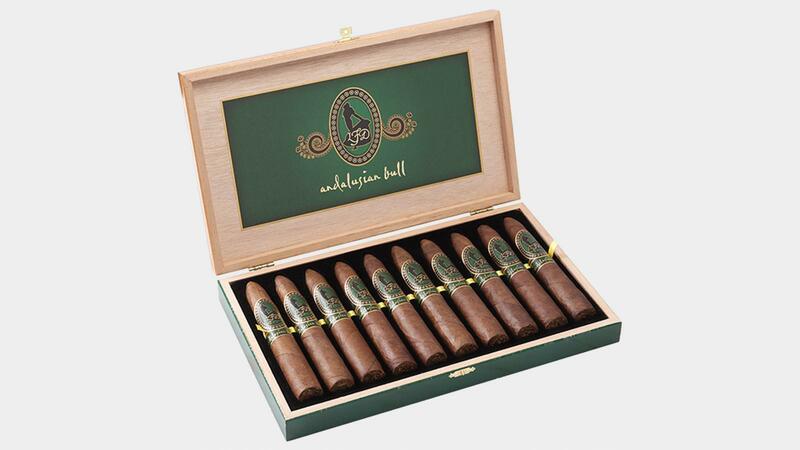 Exceptionally crafted, complex, full-bodied, this is a triumph of cigarmaking. The Dominican puro measures 7 5/8 inches by 49 ring. Despite its official price of about $17, don’t be surprised to see it command much higher prices at retail due to its prestige and scarcity. La Flor Dominicana’s Litto Gomez has an affinity for cigars with interesting shapes. First there was the Chisel, a wedge-shaped cigar, and now there’s the Andalusian Bull (above), a curvy Salomon born from an old cigar mold that he found in Belgium. At 6 1/2 inches by 64 ring, the Bull showcases a powerful marriage of strength and spice while remaining balanced. Eye of the Shark is a modified Arturo Fuente Don Carlos cigar, rolled with a special blend and presented in a unique shape measuring 5 3/4 inches by 52 ring. The cigar is box-pressed at the bottom and tapers into a rounded belicoso. As the full-bodied cigar burns, new layers of complexity unfold with every puff. A must-try cigar.